Is It Just Me, Then? Tea drinking is famous for being ritualistic - everyone has their own. The Japanese take it to extreme with fancy costumes and precise movements. Your own ritual might just involve firing up the Kelly Kettle, preheating the teapot, or being picky about whether you put the milk in first or last. Either way there's a build up of tension culminating in the actual pouring of the treasured brew. So, it's a major pisser when the teapot doesn't work. 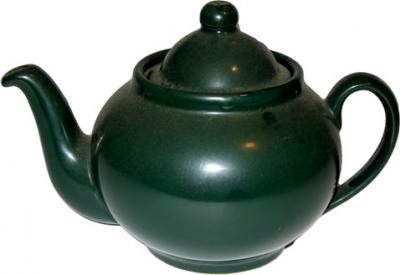 You'd think it would be easy to design a teapot wouldn't you? I mean there are thousand of beautifully efficient teapots out there, managing to get tea into mug with absolutely no fuss at all. But, unbelievably, there are equally as many so-called teapots which can't do this. For some reason their designers thought it would be fine to produce something which can't be moved without (a) the tea spilling out of the lid and onto the table (b) the tea spilling out of the sides of the spout and on to the table, or (c) scalding the hand of the pourer because there is no insulation between the pot and the handle. Some of these gems manage to do all three simultaneously. Equally unbelievably there seem to be thousands of cafes and service stations just as content to buy and use these things in bulk. How does this happen? I mean the efficient blueprint does exist and isn't patented - there should be no problem. And you only have to use the thing once to know it doesn't work - we've had centuries to perfect this stuff and it blows my mind that we're (it isn't just me is it?) still suffering. Maybe no one else is bothered. Some one tell me, what is the use of a back pocket on a rain jacket that can't be accessed without taking said jacket off? You're likely to be wearing the jacket because it's either wet, or cold. So you're not going to be too keen on disrobing to get whatever it is you've stuck in there, are you? Are you?! There are quite a few things that might usefully be carried in a back pocket: A bottle of water, a spare pair of gloves or a woolly hat, a sandwich or two. So I want a quick gulp of water. I'm standing in the middle of the river. I start off trying to unzip the back pocket in situ. This involves a fair bit of grunting and stretching and tugging on the jacket. If you're quite flexible then you might successfully locate and grab the zip (although this might be judged a miracle if the designer has thoughtfully hidden the tiny zip under a flap). Then you have to do more grunting to open the zip far enough to get into the pocket. This will result in you dislocating your shoulder and pulling a muscle in your neck - which is probably a good thing as actually trying to retrieve anything from the open pocket will end in you slipping a disc, and falling in. At this point you'll give in and either (a) decide to die of dehydration, which tends to slow the catch-rate somewhat, or (b) wade angrily to the bank, take off your jacket IN THE RAIN! and get a soaking, thereby defeating the whole point of wearing the jacket in the first place! I'm only aware of one jacket that puts the zip on the side of the pocket. Blimey I bet that was some kind epiphany when the designer came up with that one. Must've taken years of training and experience. Still you've got to give them some credit for thinking about it and solving the problem. Shame that this is the most expensive jacket currently available. The bizarre thing is that in an industry that has no shame in copying other's ideas no one else has thought to follow suit. I can see the design meeting now. Everyone gathered around the design table to discuss Wading Jacket Improvement for 2012. Lots of blank faces, with blank design pads in front of them.